A vacant rectangle, left blank for a work expressing modern feeling is a mute testimony to the city of Chandighar in North India, designed and built by le Corbusier in the 1950’s. The title of the piece comes from Le Corbusier’s book The City of Tomorrow and Its Planning (1937). 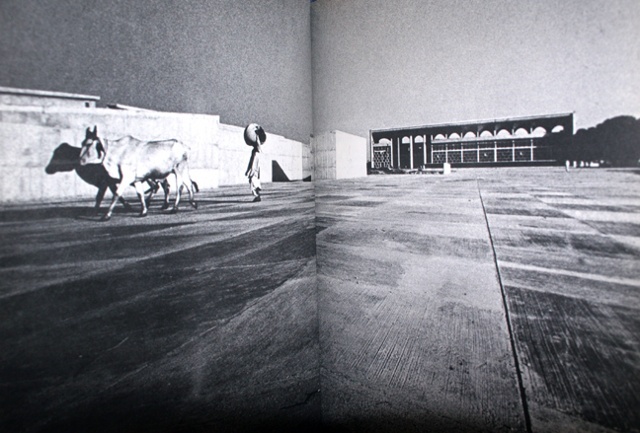 The series of photographs reveal glossy pages from books on Chandighar that are preserved in the vast Le Corbusier archives all over the world, and documents of how Le Corbusier’s cement and steel buildings endure in the otherwise rural landscape despite failing as a modernist utopia – a vestige of a canon fallen into irony. It looks backward at the lineage of utopian city planning in India by idiosyncratically connecting it with the evolution of Indian cities. Jesal Kapadia was born in Bombay India, where she studied Commercial Arts and worked as a graphic designer. She moved to Amherst, Massachusetts in 1996, where she completed her MFA. She is a graduate of the Whitney Independent Study Program, and serves as a co-art editor for Rethinking Marxism since 2003. Since 2004, she has been working collectively with members of the 16beavergroup, an artist community that functions as a social and collaboration space. Recent artistic projects and exhibitions include: ‘Ditto or the same as what has been said’ for the Guangzhou triennial in China; ‘A vacant rectangle left blank for a work expressing modern feeling’ (shown in ‘Properly past’ an exhibition at Rotunda Gallery); ‘The Laughing Club’ (part of a traveling show for the Dalai Lama Peace Project); collaborations with 16beavergroup for October magazine; and ‘Setting in Motion’ (a project co-curated with Susan Jahoda for Rethinking Marxism 2006). Publications include ‘Act Patriot Act’ together with 16beavergroup and ‘Telegraph’ a newspaper including text written by Yates Mckee, commissioned by Art in General. Her work has been shown widely, including the New York South Asian Arab Film Festival, Magic Lantern Cinema in Providence, Experimenta Film Festival in Mumbai, SENI International Visual Arts Festival in Singapore, Contemporary Arts Center in Vilnius, Lithuania, MIT’s Media Test Wall, Cambridge, Momenta Art in Brooklyn, Socrates Sculpture Park, and the Vera List Center for Arts and Politics.